‘Jyn’ (or ‘gin’) is an old term, a shortened form of ‘engine’, meaning any sort of machine or mechanism. 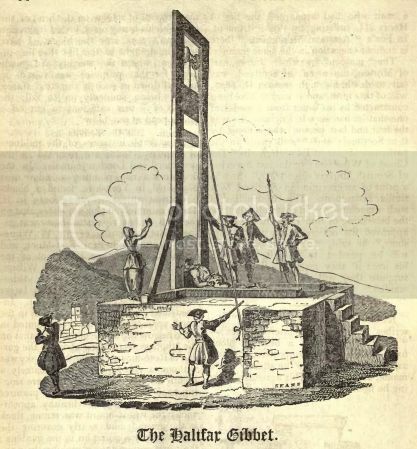 The jyn at Halifax was a death-machine, a type of guillotine, on which thieves were executed. Decapitation by axe or sword was not uncommon in Old England but the Halifax Gibbet was unique in the country, as was the readiness to use it. Halifax, now in West Yorkshire, was subject to the Lord of the Manor of Wakefield, a part of the Duchy of Lancaster, and if a thief was caught in the Forest of Hardwick (a ‘forest’ was a measure of land, usually put aside for hunting and not, necessarily, densely wooded), with goods worth more that thirteen and one-half pennies, either handhabend (with the goods in his hand, or in the act of stealing), backberand (carrying the goods on his back) or confessand (having confessed to the theft), he would be brought before the Lord’s bailiff in Halifax. This officer summoned a jury of sixteen frith-burghers and the accused would be tried, with witnesses giving evidence not on oath. If found not guilty, the accused would be released on payment of their fees. If found guilty, they would be displayed in the stocks for three market days (Tuesday, Thursday and Saturday), with the goods on their back, if they were portable, or set before their eyes if they were not. On the third day, after sitting in the stocks, they would be taken to the Gibbet and beheaded, and a coroner’s jury would be convened to investigate the cause of death and if the proceedings had been carried out lawfully, (quite often, this jury would be composed of the original jury that had tried the case in the first place). There were five conditions that had to be met; firstly, the felon had to be captured within the liberty of the Forest of Hardwick. If they were outside it, they were beyond the jurisdiction of the bailiff and if they could escape and cross the boundary, there was nothing the bailiff could do to bring them back. Two men did escape, one called Dinnis who, on the day allocated for his execution, escaped from custody and ran the five hundred yards to life, freedom and liberty. Another, one Lacy, escaped and lived for seven years before, inexplicably, he returned to Halifax, was taken and beheaded in 1623. The second condition was that the felon had to be caught either handhabend or backberand, or had to confess their crime in court. 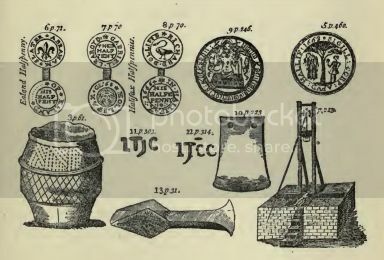 Thirdly, the value of the goods had to be worth thirteen and one half pennies or more, an odd sum but Zachary Grey, in his notes to Butler’s Hudibras, indicates that this sum of money was the ‘Hangman’s Wages’, paid to an executioner for carrying out his duty. Fourthly, the condemned man had to be placed in the stocks for three occasions prior to execution. This seems to be an odd one, as some prisoners were captured, tried and executed in the space of a single day, whilst others were taken on a Monday, tried and put into the stocks on Tuesday, Thursday and Saturday before being beheaded. The point seems to be that they were tried as quickly as possible and executed on the principal meeting day, which was Saturday. Fifth, and lastly, was that they were beheaded by the Halifax Gibbet. This was a wooden structure set on a stone platform, with a flight of steps leading up to it. In the two slotted uprights, each standing five yards, and below a transverse crossbeam, was a sliding wooden block, into which was set an iron axe weighing seven pounds and twelve ounces, about nine inches wide at the blade and about ten and a half inches in length. This block was drawn up in the slots by means of a cord and this done, the cord was secured by a wooden pin in a hole on the frame of the machine. If the condemned man had stolen a beast, the animal was attached to the pin and driven away, pulling out the pin and causing the axe to fall. If an animal was not involved, either a group of citizens would take hold of a rope and pull out the pin, or the bailiff himself or his servant would cut the rope, allowing the axe to descend and cut off the felon’s head. There is a story that a Halifax market-woman was riding her horse past the Gibbet as the axe fell and the severed head bounced across the platform and into her lap, where it seized her apron in its teeth and refused to let go. Halifax, like many areas of the North of England, was well-known for its textiles and the severity of the Halifax Gibbet may reflect the situation faced by wool weavers in the area. In the finishing of woven wool fabrics, the lengths of cloth are washed and stretched out on tenterframes to dry, and it was usual for the tentermen to leave their frames out in the open air to dry. Unscrupulous thieves would see the unattended frames and steal the valuable bolts of cloth, so the weavers needed a quick, easy and severe deterrent to make the light-fingered think twice about purloining their wares. 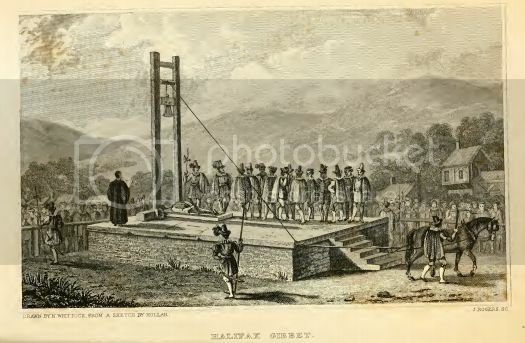 The usual assizes were not nearly regular enough to do this – there might only be two hearings per year on some circuits – but a local solution was the Halifax Gibbet. Incidentally, the cloth was held onto the tenterframes by the tenterhooks, which is where our phrase, ‘being on tenterhooks’ – meaning being extremely apprehensive or nervous, comes from – it is not, as some people annoying say, being ‘on tenderhooks’, there is no such thing as a tenderhook. It’s a tenterhook. 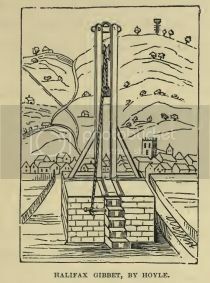 Cromwell’s puritans dismantled the Halifax Gibbet in the 1650s, (the last use was in 1650) and the stone base was not re-discovered until 1840. A non-working replica was erected in 1974, together with a plaque listing the names of over fifty victims – in all, it is estimated that over one hundred criminals were beheaded at Halifax over the years.